A miracle is taking place across our nation! This month, thousands of nursing home residents who were feeling hopeless and forgotten are now being visited by trained missionaries who help them find the miracle of hope, peace and eternal life in Jesus. We are so grateful for our Friends and Partners! It is because of your giving hearts that God Cares Ministry is able to recruit and train care teams to adopt senior care homes to share God’s love. Charitable giving is vital to the miracle of life! So, not only are our Ministry Friends and Partners blessed by their own generous giving, they are vital to our mission to share the miracle of life with the elderly across our nation. We invite you to be an active part of the miracle! 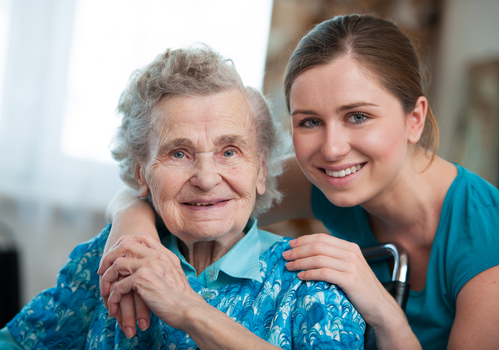 Is helping the elderly in care homes something that touches your heart? If so, we would like to invite you to experience the blessing of God’s word, “It is more blessed to give than receive”, by becoming a Ministry Friend. Our Ministry Friends make an Acts 20:35 faith commitment of $20.35 per month or more. Ministry Friends enable us to recruit and train care teams. Each team will minister to an average of 30 care home residents per week! Some Ministry Friends feel led to become a Ministry Partner. Ministry Partners occasionally help fund specific projects or items for expanding our reach into more churches and care homes. They also help by inviting others to become actively involved with the mission of God Cares Ministry. Some of our Friends have also been led to leave a legacy. These Legacy Friends include God Cares Ministry in their estate planning, which helps to impact this mission far beyond their years. Please select how often you would like your contribution to reoccur. This is a single contribution, your gift will only be submitted one time. If you would like to give more than $20.35/Month, please select "Other Monthly Contribution" and fill out your Monthly Contribution. If you would like to give more than $61.05/Quarter. please select "Other Quarterly Contribution" and fill out your Quarterly contribution. If you would like to give more than $244.20/Year, please select "Other Annual Contribution" and fill out your Annual contribution. Click Submit to donate using your PayPal account! Please contact our office at 440-930-2173 and someone will assist you with this payment option.